Once again we are confronted with adverse publicity following the posting of a video by PETA allegedly depicting mishandling of hens on the Sulfur, OK Farm operated by Mahard Egg Farms. Apparently during late July and early August, high temperatures resulted in episodes of mortality. The video depicts the removal of mortality from cages with temporary storage in pits of high-rise houses. Dead hens were then elevated using a mechanized belt to a trailer for transport presumably to a landfill. A few live hens were apparently present within the mass of dead birds. The video depicts these hens being killed by slamming their heads against a bar on the trailer. The worker involved in the task of distributing dead birds in the trailer did not appear to be supervised. The video also showed hens presumably during routine depletion according to the PETA voice-over being placed into a kill cart with an open top which would not allow effective euthanasia using carbon dioxide. This again resulted in conscious birds having to be killed by other than approved procedures. 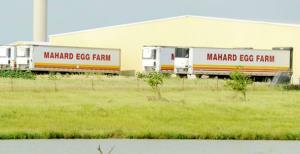 Mahard Eggs is certified by the UEP welfare program. Obviously any deviation from acceptable practice especially when subject to a video posting on the social media degrades the value of the UEP program which in itself is an acceptable set of standards. Obviously UEP auditors visit farms subscribing to the program at intervals and cannot be expected to ensure ongoing compliance on a 24/7 basis. In this case however it is evident that workers involved in the process of disposing of heat mortality were not trained in appropriate methods of euthanasia including cervical dislocation. Unfortunately with high acute mortality associated with excessive heat, some dead hens will not be removed from cages especially on the higher tiers where most mortality occurs. The dead hens as depicted in the video show advanced decomposition (“pancakes”) denoting lack of diligence in removal of mortality. It is not possible to determine the number of dead birds in cages as intrusion and clandestine videos invariably concentrate on individual hens and cages. It is understood that the local law enforcement authorities are investigating the case and as with other incidents in the past, low-level employees will probably be fined and life will go on. As with many cases of alleged deviations from acceptable welfare, PETA made Kroger, a major customer of Mahard aware of the events and after review of the video the chain suspended purchasing from the producer. Mahard Farms has a history of non-compliance with regulations. The Environmental Protection Agency assessed a fine of $1.9 million for contamination of pasture with waste extending over the period 1997 to 2011. The company was the subject of an FDA warning letter on April 26, 2017 confirming nonconformance with the Salmonella Prevention Rule which is strictly adhered to by all commercial producers. The warning letter outlined major deviations from practices which are common to the industry and denotes a lack of concern for food safety and the potential to degrade the image of all producers. The industry has progressed from the days when individual producers set their own standards and operated as they pleased. Now under regulations issued by the FDA, the EPA and the Department of Homeland Security, egg producers must conform to laws and regulations and bear the cost. The UEP has established science-based standards for welfare to improve the image of our industry and provide customers with an assurance that flocks are treated humanely from hatch to depletion. It is obvious that Mahard Eggs needs external independent advice to upgrade training and facilities and above all to create an acceptable culture of compliance with food safety, welfare and employment training. If there are any other Mahards out there they need to engage in self-evaluation for their own benefit and as an obligation to the entire U.S. egg-production industry.